Watchmaking, by nature, is an incredibly intricate process. Dial-making is a particularly difficult creation within a timepiece, but crafting a gemstone dial is a truly delicate task. It is quite difficult to turn a gemstone into a dial due to the brittle nature of the stones and the incredible thinness to which they must be cut. Generally, gemstone dials for luxury timepieces run the gamut from lapis lazuli to malachite, tiger eye, jadeite, onyx, coral, turquoise, carnelian, and a host of others. The rough stones are precisely milled and cut into thin sheets that are then high-polished by hand to achieve their sheen. Individual orbs, or rectangles—depending on the shape of the watch dial—are then cut from the sheet. Depending on the dial design, the gemstone disk then needs to be carefully drilled so the hands, and the numerals or indices can be applied—with each incision the risk of cracking is imminent. Certain watch brands sometimes add subdials to the gemstone to showcase another function (such as a tourbillon escapement, for example). These are typically engulfed in a gold circle and then set into the dial. 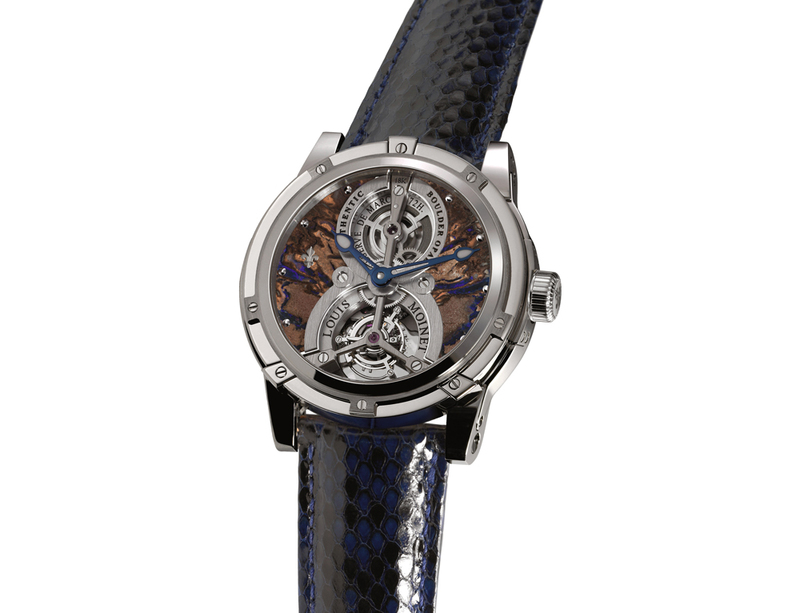 Other watches brands take the time to create entire dials using a marquetry technique, whereby, hundreds of tiny gemstone pieces are set in place, much like a mosaic. Depending on the design of the dial, these stone masterpieces are often time-consuming and expensive to create, adding anywhere from a few thousand to several thousand pounds to the cost of the watch. Here, we bring you a look at six superb men’s and women’s gemstone dial watches. 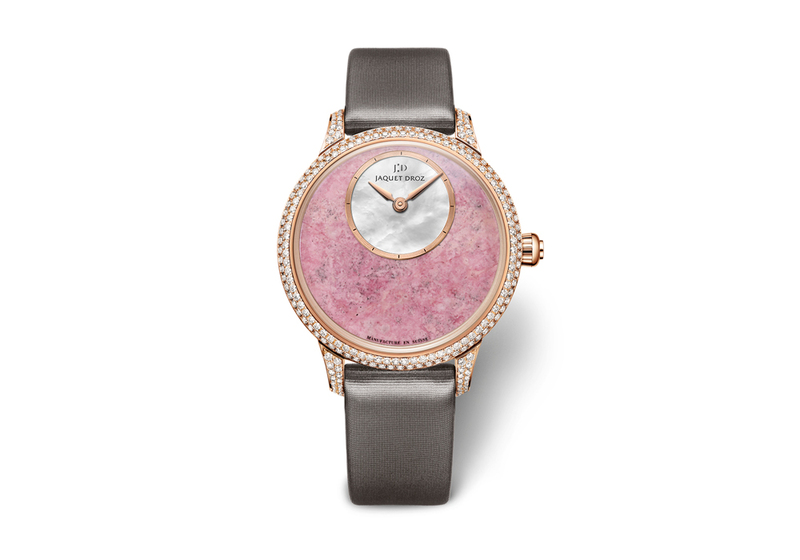 This year, luxury Swiss watch brand Piaget pulled out all the stops when it comes to gemstone dials. 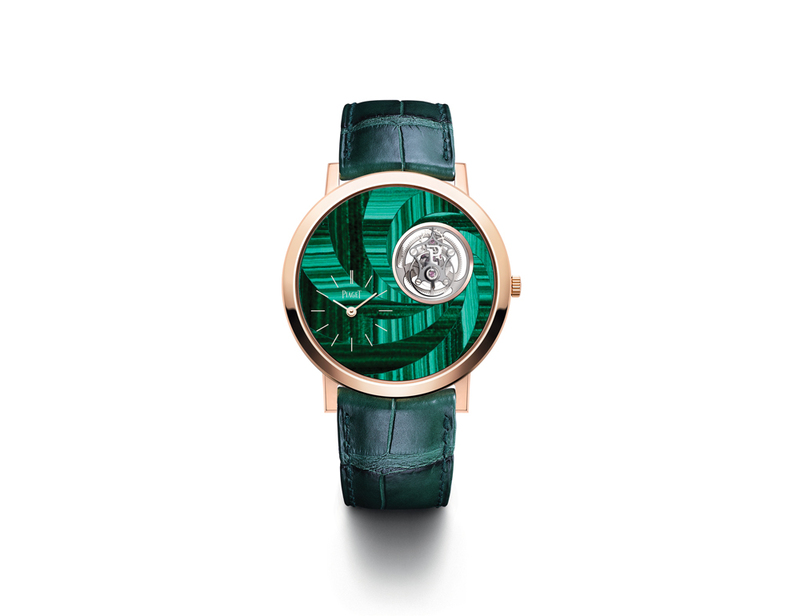 The brand has been working with stone dials since the mid 20th century and for 2018 the watchmaker unveiled its stunning Altiplano Malachite Marquetry Tourbillon with a gemstone marquetry dial. This 41mm 18-karat rose gold watch houses the Piaget 670P ultra-thin movement and the remarkable dial is created in a swirl pattern using a variety of shades of malachite, from emerald, to pine, and more. Just eight individually numbered pieces will be made. 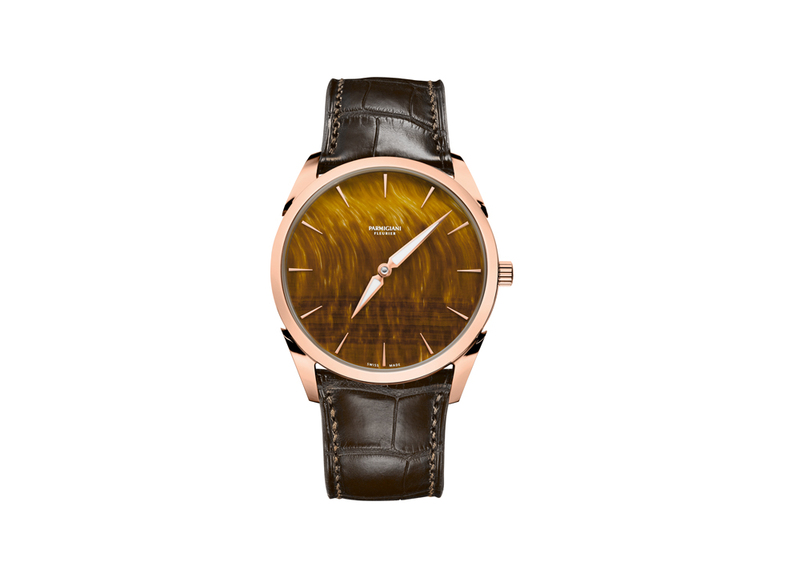 This year, Parmigiani Fleurier turned to the beauty of tiger’s eye for the dial of its newest Tonda 1950 automatic watch. The unique qualities of this gemstone lie in its striations of yellow, gold, and brown hues in natural patterns that mimic the animal kingdom’s most majestic creature. To create the dial, 24 tiny holes are drilled into the tiger eye to secure the indices. Only 50 pieces will be made. 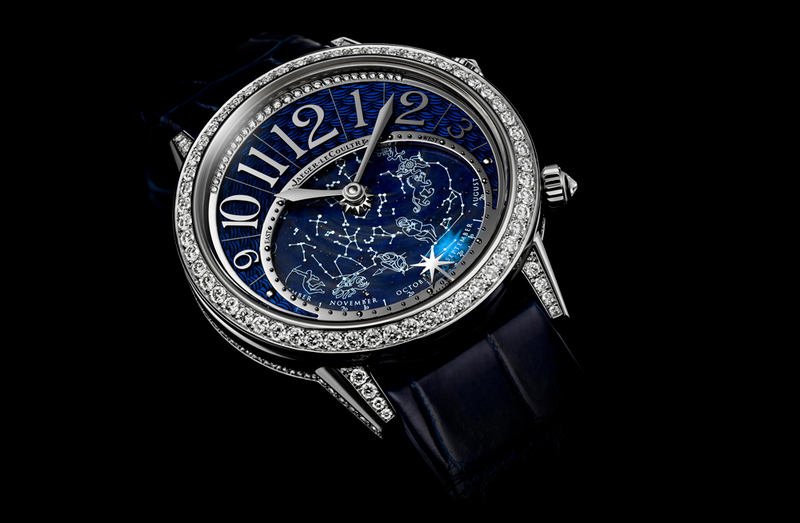 This lovely La D de Dior watch is a precious representation of miniaturised beauty. Crafted in stainless steel with a new Milanese mesh bracelet design, the petite 19mm quartz watch features a dial made of rich blue lapis lazuli. The 18-karat yellow gold bezel and crown are set with diamonds. Turning to a solid piece of astorite for the dial of this Petite Heure Minute Astorite watch, Swiss watch brand Jaquet Droz embraces the feminine spirit. The pink stone is named for entrepreneur John Astor, the original owner of the Colorado mine where the stone was found, who was a victim of the Titanic disaster. The 35mm watch is crafted in 18-karat rose gold, set with diamond on the bezel and lugs, and has an in-set mother-of-pearl subdial. Just 28 pieces of the automatic watch will be made. A master at gemstone, fossil and meteorite dials, independent Swiss watch brand Louis Moinet regularly uses superb and rare gemstones as dials. This Treasures of the World–Boulder Opal watch is a unique piece that uses a rare opal from Boulder, CO as the dial. The watch is powered by the LM14 tourbillon movement that was awarded first prize in the International Chronometry Competition.